The Elbe traditional kitchen mixer is designed and manufactured by Reginox. The Reginox brand is renowned for its amazing products that are created using the latest methods and to the highest standards. The tap has a chrome body with dual lever function, the lever taps are in a white finish which makes the Elbe blend into classic ceramic sinks or in a kitchen with a traditional theme. Q. does the tap come with copper tails? Flexi hoses do not allow for an adequate flow in my property. This tap comes with flexi hoses but copper tails can be purchased separately from most plumbing supplies stores. Q. Can you please tell me the weight of this tap? Hi, this product is approx. 1kg. I hope this helps! Q. Is this tap suitable for mounting directly on/through a worktop? Thank you. Hi Alex, this product is designed to be fitted to a kitchen sink. Thank you for your message. Hi Bill. The overall height of the Reginox Kitchen Mixer is 355mm. 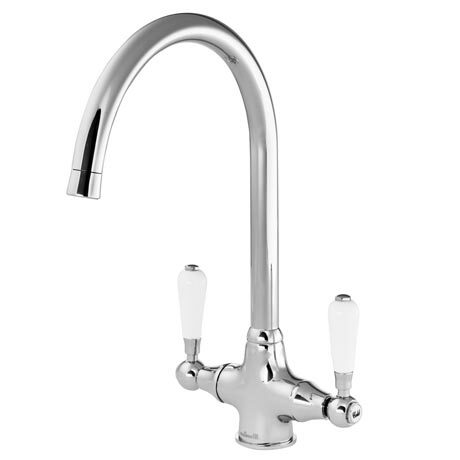 Q. will this tap be suitable for low pressure hot water? Hi Derek. Minimum pressure is 0.2 bar. Plumber would need to check pressure for suitability. Great price nice looking and practical. Had three sink taps similar to this one. This is by far the most quality product. Easier to install than the others. Been installed for a couple of months with no issues. Stylish and easy to fit. Just make sure it fits under your kitchen units. Very pleased with it. "Looks amazing , still in box as we haven't installed it yet." Great looking tap - arrived promptly. Cheaper and better quality than the one it replaced. Good value for money. Looks good. "QUALITY product very very pleased, quick delivery would definitely recommend to our friends and family." Looks Good but a few problems fitting it. I bought this tap to replace an old one that had been leaking for some time, so the sink and worktop were all in position and i didn't want to disturb them.The first problem was in fitting the flexible hoses. The tapped holes are recessed into the base, so that when the nut of the connector is tightened it drops out of reach of a normal spanner. I only just managed to reach them with a small pair of (narrow) pipe grips. I can't see why the holes couldn't have been left flush to the base where the M6 tapped hole for the clamping screw is.Then it came to clamping the tap to the sink I found that the clamping nut is 9mm A/F, where a normal (engineering) M6 nut is 10mm A/F. the 10 mm socket was ok until the nut started to tighten, but then started to slip, requiring another trip to the DIY store. The socket needs to be of the `Deep' type, to reach over the M6 stud. However, once clamped up the fit is rock steady. Again very pleased with this mixer tap, good quality, easy to fit, would recommend.